As the automation era unfolds around is, it’s becoming increasingly apparent that no jobs are safe—not even those belonging to dogs. Introducing Swagbot, the world’s first herding robot. Developed by the Australian Centre for Field Robotics at the University of Sydney, SwagBot proved successful in its first field test. The robot, described as a “motion platform for cattle station operations,” can pull heavy trailers and traverse across rugged terrain. 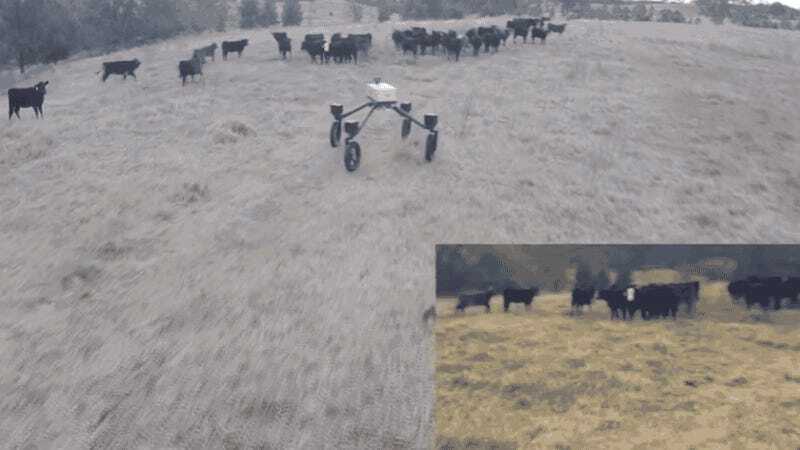 Eventually, the autonomous machine will be used to manage livestock on Australia’s sheep and cattle stations, which are often located in hard-to-reach regions. During the recent trial, the robotic cowboy demonstrated that it was capable of herding cattle and navigating its way around ditches, logs, swamps, and other obstacles. With this phase complete, the researchers will turn their attention to teaching SwagBot to recognize animals that are sick or injured. It will be equipped with temperature and motion sensors, which will allow it to detect changes in an animal’s body temperature and gait. It’ll also be able to steer the animals towards fields with sufficient pasture to graze on. SwagBot sounds all fine and well—but will it cuddle up next to you after a hard day’s work?